Have you heard about “Mobilegeddon”? On April 21 2015 Google adjusted it’s search ranking where sites that are not mobile-friendly drop in the search results. All of this is fixable in CSS, but I applied some solutions in HTML as well. TrailsNH has about 4000 URLs indexed in Google with around 800 re-indexed on average everyday. So I expected all the mobile usability errors to be gone in a week. Apparently the mobility tester is a separate bot from the page indexer. 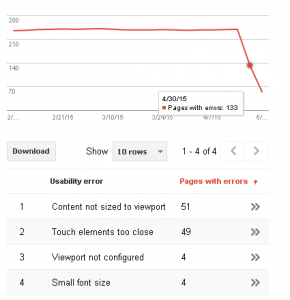 My Webmaster Tools Mobile Usability report shows a portion of the site gets checked about every 15 days. So how does your site fare? Here’s quick and easy access to the usability test. If your website does not pass the Google Mobile-Friendly Test give me a call. I can fix it for you.